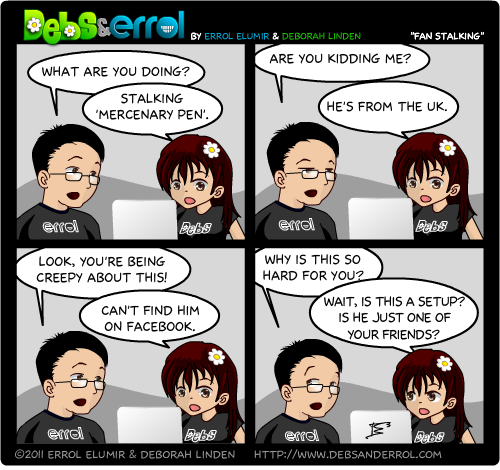 Errol: I’m serious, she immediately iplookuped MP and tried to find out who he was. She’s obsessed with stats. She’s on our FB page and looks at all the demographics daily. I’ve actually stopped using facebook for over a year and a half now- I decided it was using too much of my time that I preferred to spend on other things. Also, if you think this is a setup Debs, try googling me (I’m in a few places on the first page). You know what’s kind of funny? Even I googled mercenary pen. This website is turning into some weird cult…. well can’t you just use boolean operators to screen out results containing terms such as “debs” and “errol”?